Marc Marquez is having the best season that can be for any rider on the MotoGP grid. The defending champion has won the fifth round of the 2014 season at the French Le Mans circuit. He has now won the first five consecutive races of the season all starting from the pole position since Mick Doohan in 1997. Marc Marquez is also the first rider since Giacomo Agostini in 1972 to win first five races of a season and the first rider since Valentino Rossi in 2008 to win five races consecutively. The new rules in MotoGP from this season with the Open class and the Factory seems to be paying dividends for the less competitive teams. The leverages given to the riders in the former has given them a better chance to be competitive. The spectators are being treated to some of the best early laps in all five races so far and overall better racing. Though the top results has remained same. Europe offers some of the best tracks in the MotoGP calender and the Le Mans is one of them. The weather here can be tricky sometimes; however, this time the conditions were quite perfect with bright sunshine all throughout the racing weekend. The MotoGP grid line up had a few surprises this time with Tech 3 Yamaha's Pol Espargaro and Ducati's Andrea Dovizioso qualifying on the first row with second and third positions respectively while Marc Marquez was on Pole. Movistar Yamaha's Valentino Rossi and Jorge Lorenzo were in the second row on fifth and sixth positions respectively. As the 28 laps race went underway, Ducati's Dovizioso imagined the lead initially and through lap 1. Many riders were seen running wide at different corners in the early part of the race including Marc Marquez when he had to sit up to avoid a collision with Lorenzo and slotted in to the tenth spot. During this time, Jorge Lorenzo settled in to the eighth spot with Pedrosa in ninth. In the next couple of laps, Rossi started hunting down Dovizioso and the two exchanged some passes with Rossi eventually making it stick and leading the race from thereon. Marquez, meanwhile, made progressive passes through the field and arrived behind Rossi with little over half of the race remaining. Behind the leading pair, the battle continued for the remaining podium spot with Pol Espargaro and Stefan Bradl fighting it out. The fight for the third spot didn't last long for the German as he started losing his pace and eventually relegated to seventh at which he finished the race. Valentino Rossi had quite a great race finishing in second behind Marc Marquez. The 35 years old Italian treated the crowd and his fans to some great racing and received loud cheers as he trumped Ducati's Andrea Dovizioso for the lead. Rossi led the race for quite some time but was eventually passed by Marquez when the Italian ran wide on one of the turns in lap 16. Alvaro Bautista had his best race of the season after the disappointing start to the season. He was well outside the top five but made a strong come back from mid-race and tipped off Pol Espargaro for the third spot on the podium. Pol Espargaro also had a fantastic result eventually finishing in fourth spot. He maintained a good pace throughout the race and was a strong contender to finish on the podium. Dani Pedrosa and Jorge Lorenzo had disappointing results in fifth and sixth positions respectively. Drive M7 Aspar's Nicky Hayden had a disastrous race as he didn't make it through the first lap itself. Hayden was hit on the inside by Pramac Ducati's Andrea Iannone that sent the American on the ground. Iannone himself fell off and lost his race the following lap. 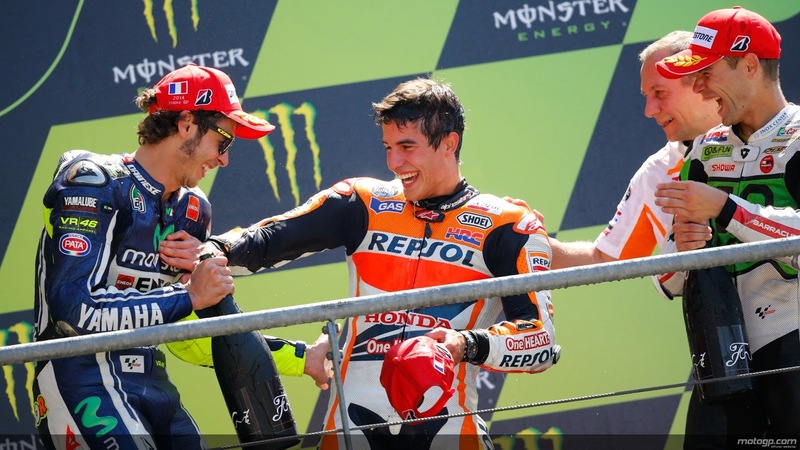 Marc Marquez continues to lead the 2014 championship with 125 points followed by Dani Pedrosa with 83 points closely followed by Valentino Rossi with 81 points.